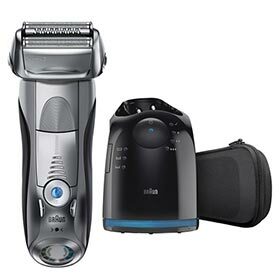 Braun launched the Series 9 back in 2015 to take over the popular, but aging Series 7 line of electric shavers. With more power, more cutting elements and a new design, the Series 9 is Braun’s most advanced and most expensive electric shaver yet. One year after its introduction, Braun suddenly revamped the entire Series 9 line, the most important changes being a new shaving head and wet/dry operation for all the new shavers. Part of this new generation, the Braun Series 9 9290cc comes in a matte silver finish and includes an automatic Clean & Charge (cc) station. Moreover, this particular model is shaping up to be one of the best selling Series 9 shavers due to its lower price compared to other similar Series 9 variations. But since it still has a hefty price tag, you’re probably interested in finding out if it’s worth your hard earned money. With that said, there’s a lot to like about the 9290cc, but there are some negative aspects as well. To find out if it would be a good fit for you, I compiled my findings into this review after thoroughly testing the Braun Series 9 9290cc over the course of one month. Series 9 shaving head orientation: does it matter? Wrapup — Who should buy it? The Series 9 9290cc packs quite a lot of technologies and features, so I’ll briefly go over the most important ones. Note: The Braun Series 9 9291cc model is identical to the 9290cc reviewed here, the only difference between them being that the former comes with a hard leather travel case instead of the usual textile type. So you could very well consider this a Series 9 9291cc review as the shavers themselves are identical. Two foils called OptiFoils that shave hairs close to the skin. They use Braun’s notorious hexagon shaped holes that are supposedly superior for capturing hairs compared to the regular rounded perforations. A HyperLift & Cut trimmer — this is a novelty and a distinct element of the Series 9; the specially designed trimmer lifts and cuts flat-lying hairs. You can identify it by its distinctive golden color on the updated Series 9 models like the 9290cc in our review. The unique color of this trimmer is the result of a Titanium Nitride coating, a ceramic material used for its anti-corrosive and edge retention properties. A Direct & Cut trimmer that captures hairs that grow in different directions. One thing that caught my attention was Braun’s attempt at marketing the Series 9 as a shaver with 5 cutting elements. In Braun’s view, the fifth is the so-called SkinGuard, a piece of metal located right next to the Direct & Cut trimmer that supposedly smoothens the skin. The SkinGuard on the shaving head of the Series 9 9290cc. But let’s be honest, this isn’t a cutter and should not count as one. 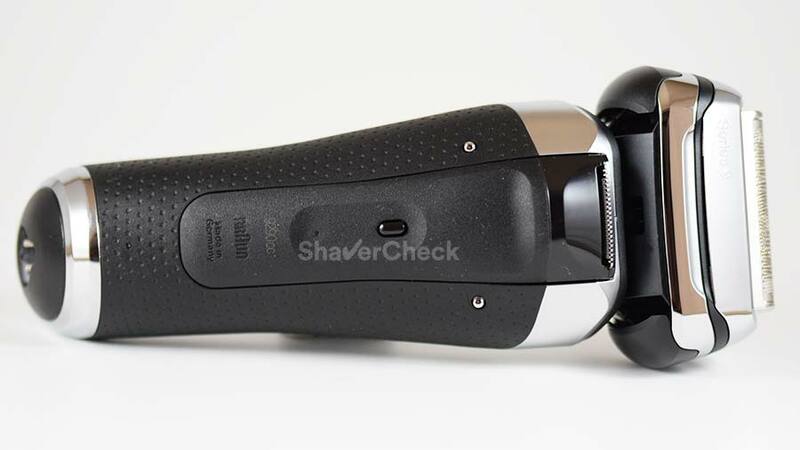 Just for the record, the Panasonic Arc 5 is an example of a shaver with 5 active shaving elements. 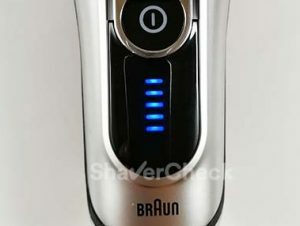 With the Series 9, Braun ditched the personalization modes of the Series 7 that allowed the user to manually alter the power output of the shaver depending on the area they were shaving. Those were pretty much useless and Braun probably thought the same. Instead, they implemented the so-called SyncroSonic technology that reads the density of the beard and adjusts the power accordingly. This type of technology is also found on high-end Panasonic shavers. 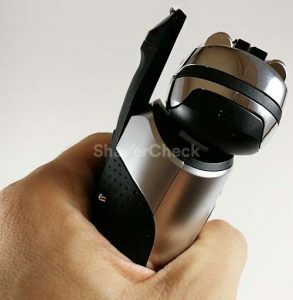 I would personally prefer full power for the entire shave as I never found this type of gimmicky features to make any significant improvements to the actual performance of the shaver. According to Braun, the four cutters are mounted on a 10 directional pivoting head: they can be independently depressed and the whole shaving head can pivot back and forth. I have no idea how they came up with the number 10, but what I can tell you after using the 9290cc is that this really works. 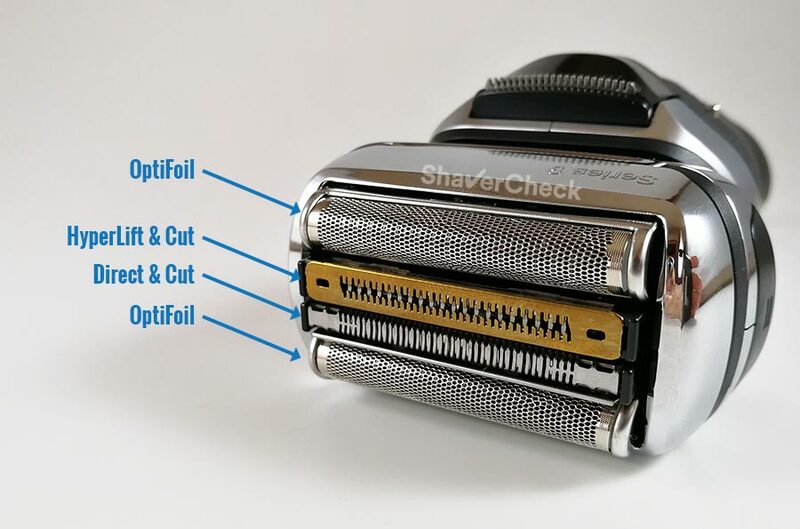 The Series 9 has one of the best implemented flexing shaving heads of any foil shaver. It’s simple, but it works great (more details on this in the performance section of the review). 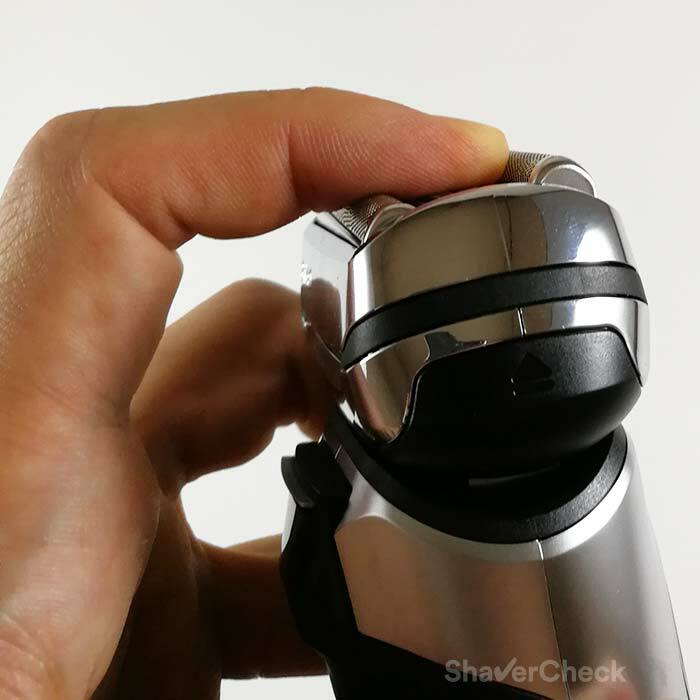 For more precision, the head can also be locked into a fixed position with a dedicated switch located on the front of the shaver. Waterproof, wet & dry operation. As mentioned earlier, all the updated Series 9 models are now suitable for wet & dry use and can be fully submerged in water up to 5 meters deep. This means that you can use the 9290cc in the shower or with your favorite shaving cream if you prefer so. As a side note, all the updated Series 9 shavers can be identified by the model name, 92xxcc or 92xxs. The older shavers used the 90xxcc or 90xxs naming template. The cc models include the automatic cleaning station, while the s models do not. As you probably know, the Series 9 9290cc in this review comes with the Clean & Charge station that does precisely what the name implies. Moreover, it also dries and lubricates the shaving head. We take a detailed look at how the cleaning station works later on. I must admit that I was a bit disappointed to find out that Braun has decided to use plastic for the Series 9. For example, Panasonic’s latest Arc 5 shavers have an exquisite brushed metal body. 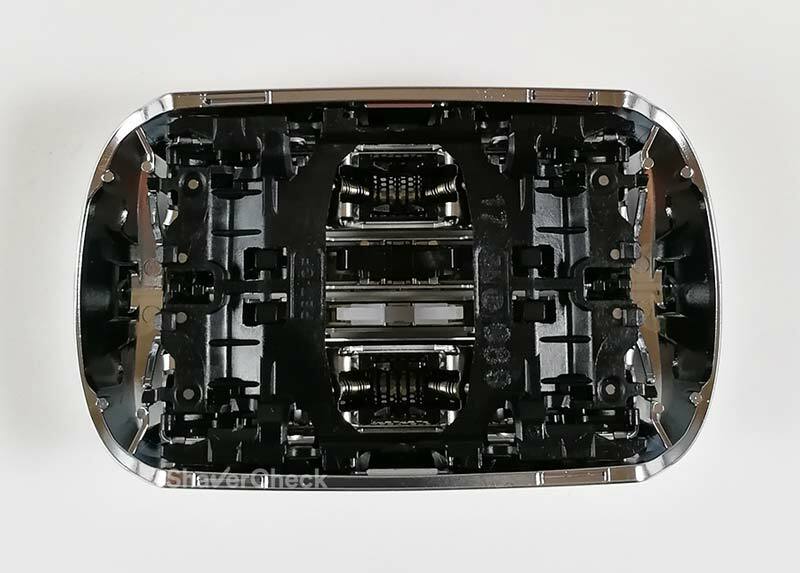 However, I was glad to see that at least with the 9290cc the silver part of the shaver’s body has a matte, frosted finish compared to the high gloss chrome treatment of other Series 9 models (9295cc, 9296cc etc.). As a result, smudges and fingerprints are a non-issue with this one. There’s still some glossy chrome around the bottom, around the ON/OFF switch, and on the foil frame. 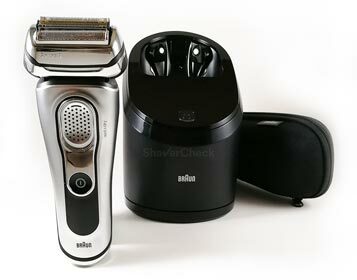 The Braun Series 9 9290cc is a very handsome shaver. The body actually looks like metal and I still wish it was made out of metal. The shaver is surprisingly lightweight and its size is very manageable despite having substantial girth towards the top part. It feels well balanced and adequately secure due to the textured rubber on the back that extends to the sides as well. The long hair trimmer on the back is cover with the same grippy material. I personally would have liked the rubber to extend even more on the sides and front like they did with the Series 5, but that would have messed up the aesthetics. With the black color scheme of the Series 5, it wasn’t a problem. The front of the shaver houses the LED display, the ON/OFF switch (that also acts as a travel lock with a long press) and the head locking switch. The shaving head can be locked in one of the 5 positions for more precision when shaving a tight spot. You can achieve that by sliding down the switch. It’s worth mentioning that this is a massive improvement over the locking mechanism of the Series 7 that was prone to breaking if excessive force was applied to the shaving head after being locked. With the Series 9 (and the Series 5 as well), the head will simply move into a different position with no damage done to the ratcheting mechanism. Despite being covered with these dimples, the switch is still a bit slippery if your finger is wet and you must press harder in order to operate it. The one on the Series 5 for example offers more grip, being made out of a softer, rubbery plastic. 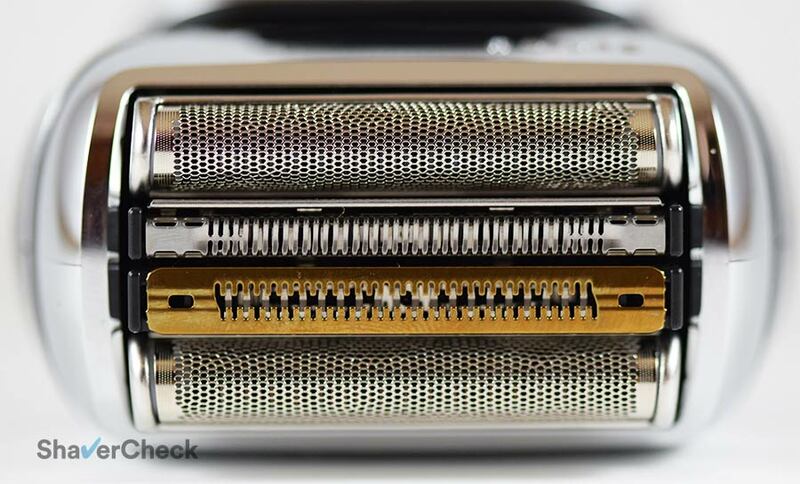 On the back of the Series 9, you’ll find the long hair trimmer and two metal studs used for charging the shaver when placed into the station. The long hair trimmer is very smooth to slide in and out. When fully extended, it just about passes the shaving head. I have to give Braun props for paying attention to small details. For example, if you slide out the long hair trimmer and the shaving head is in the way (the range of motion is quite large), it automatically slides forward and the trimmer doesn’t bump into it. Also, there’s a small button in the center of the trimmer that must be pressed — otherwise the trimmer simply won’t slide forward. The shaving head (called a cassette) appears of high quality and snaps easily and securely into place. 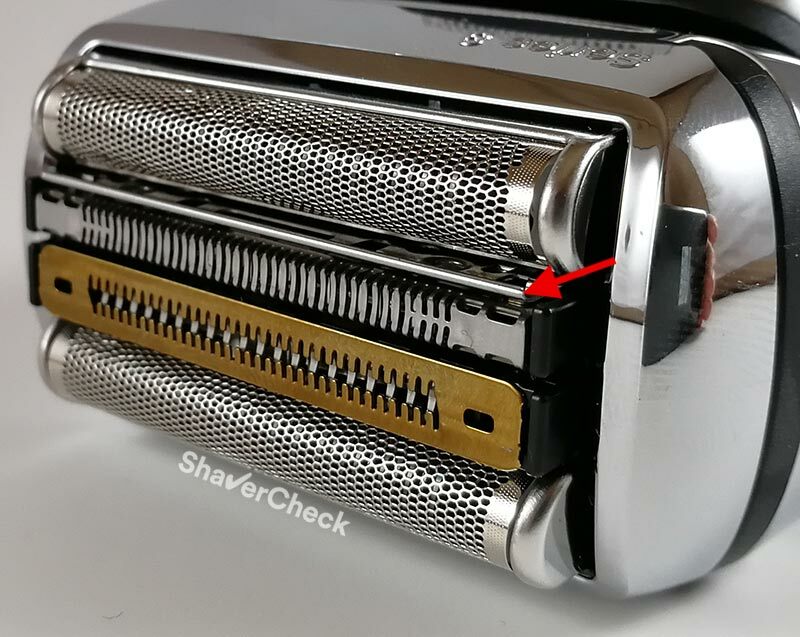 It’s also very easy to remove by pressing the two black tabs on both sides of the shaving head. It’s worth mentioning that with the original Series 9 there were some reports of the shaving head falling apart after just months of use. The culprit was apparently the HyperLift & Cut trimmer. 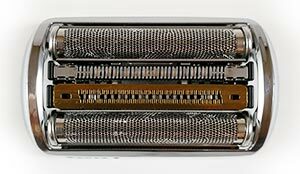 For the shaving heads of the updated Series 9, Braun outsourced their production to a different manufacturer and the problem was most likely taken care of. The new shaving heads also use the Titanium coating and have a golden color instead of blue. The hard travel case is excellent. I like the fact that Braun includes them even with the lower end models like the Series 5. The case offers excellent protection and looks and feels of high quality. Overall, the build quality and ergonomics of the Series 9 are good, even though I personally expected a bit more from Braun’s new flagship. 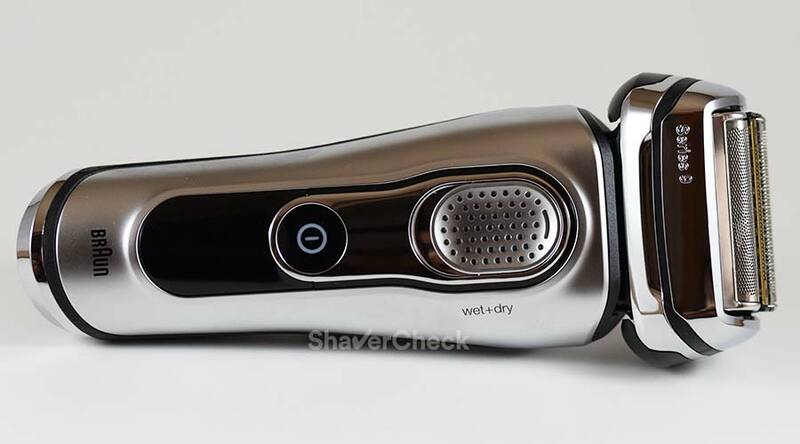 Being a wet/dry shaver, the Series 9 9290cc can only be operated cordless as a safety precaution. The older dry only versions of the Series 9 like the 9090cc could also be used while charging. However, the battery life is excellent and there’s a 5-minute quick charge option as well. With the 9290cc I get at least 10 shaves from a full charge which is very good in my opinion. The battery also charges reasonably fast in approximately 60 minutes. The 9290cc is automatically charged when placed in the station, but you can plug the cord directly into the shaver as well. My unit was bought from Europe and came with a flat cord. Some Series 9 can still be shipped with the older (and now discontinued) coiled cord. When charging, the corresponding bar indicating the current battery charge will flash. There are 5 levels, each one representing a 20% charge. A nifty feature only found on certain Series 9 models, 9290cc included, is the display showing an actual number for the last 9 minutes of remaining shaving time. This is very useful in my opinion and enhances the user experience. I would actually prefer this solution to the 5 bars approach entirely. Let’s now get to the most important part of our Braun Series 9 9290cc review and see how well the shaver performs. I tested the 9290cc exclusively for four weeks and used it for shaving daily, every other day and every two days. I shaved dry for the majority of the time but also tried it with shaving cream since this model can handle wet shaving as well. Just to put things into context, I have sensitive skin and coarse facial hair. And now the big question: how does the Braun Series 9 9290cc shave? I can honestly say that the 9290cc gave me the most pleasant, enjoyable and comfortable shave of any electric razors I’ve used so far. If I could describe the shaving experience in one word, that would be effortless. Let’s start with how close it shaves. Pretty darn close. Again, one of the closest shaves I got from any electric razor. I would say that the Panasonic Arc 5 is still the closest shaving razor, but in my case, the difference was really minor and it would be hard to say with certainty which one was better. I guess one of the reasons for the remarkable close shave is just how comfortable the 9290cc feels. I am usually very cautious when shaving and always make sure not to press excessively or go over sensitive areas multiple times. With the 9290cc however I could get away with doing these things that would normally leave me with some razor burn or at least a nasty rash. For me it is particularly difficult to get a close shave right above my upper lip, where the hairs are very thick and dense and I often have to press harder and use more strokes just to get a decent result. Doing so often leads to irritation, but there was none with the Series 9 9290cc and I could actually get a close shave without any discomfort. Comfort wise, the Series 9 9290cc is in a class of its own. While the Series 7 comes very close in this regard, the Series 9 feels subjectively smoother, faster and more pleasant to use. It’s a combination of various factors, like the increased power and the foils remaining cool even after a long shaving session. The Series 9 is arguably the most forgiving electric razor out there right now and even when my technique was sloppier it still didn’t cause me any significant discomfort. To me, the most impressive thing about the Braun Series 9 9290cc (apart from the comfort) was just how efficient it was at catching and cutting longer hairs that lie flat on the skin. I have a problem area on my neck were hairs grow in different directions and also parallel to the skin. The Series 9 managed to perform better than any electric shaver I’ve used. And this scenario — longer, flat-lying hairs — is without a doubt the Achilles heel of most electric shavers. I never managed to get a smooth shave on my neck as fast and comfortable as I did with the 9290cc. I also never experienced any pulling or yanking on the hairs even with two to three days between shaving sessions. Because it is so effective at catching stubborn hairs, the time it takes for me to complete a shave is also remarkably short with the Series 9 9290cc. The four cutting elements form a massive head that can cover a lot of ground fast. The motor is also adequately powerful and never felt sluggish. The Series 9 has probably the best implementation of a flexing shaving head. It works flawlessly and allows you to maintain constant contact with the skin even if you have very prominent facial features. Even though it’s not nearly as advanced as the one of the latest Arc 5 models, it actually improves your shaving experience. When shaving right below the jawline or on your chin you will really feel the difference compared to most other razors. The Series 9 is also pretty quiet for a foil shaver. Compared to a Series 5 for example that vibrates excessively during use, the 9290cc is much more refined. You may or may not know, but the shaving cassette on all Series 9 models can be fitted in two ways as you can see from the pictures below. And that begs the question: does the orientation affect the shaving performance? Braun says that it does not. Some of our readers say that it does. To find out, I shaved half my face with the head fitted with the titanium coated trimmer closer to the shaver’s front (option 1) and immediately after that, the other half with the head flipped 180 degrees (option 2). And to my surprise, I did notice a difference. It wasn’t huge, but with the head fitted with the HyperLift & Cut trimmer closer to the top of the shaver (option 2) it just felt smoother and the shaver was subjectively more effective at catching the longer hairs on my neck. So during an upstroke, the order of the cutting elements was: OptiFoil – HyperLift & Cut trimmer – Direct & Cut trimmer – SkinGuard – OptiFoil and that seemed to slightly improve my shave. However, these findings may vary, so definitely try shaving both ways and see which one works better for you. I wouldn’t be surprised if for some it wouldn’t make any difference at all. The long hair trimmer on the Series 9 9290cc is a bit of a mixed bag. I like the positioning, it’s buttery smooth to slide in and out and the cutter itself is adequately wide. When deployed, it extends a bit beyond the shaving head, so you can sort of see what you’re doing. However, it just feels dull and I must go over an area multiple times to get all the hairs. I mostly use the trimmers on my electric shavers to shape my sideburns and it takes me a lot to do it with the 9290cc. My old Panasonic Arc 4, with its pop-up trimmer that sits perpendicularly to the shaver’s body, shaves a lot faster and requires less effort on my part to use it. I found this to be the case with the Braun Series 3, 5 and 7 as well. Definitely not a deal breaker, but the performance of the trimmer could have been a lot better. I personally prefer to shave with cream for the majority of the time as I get closer and smoother shaves. 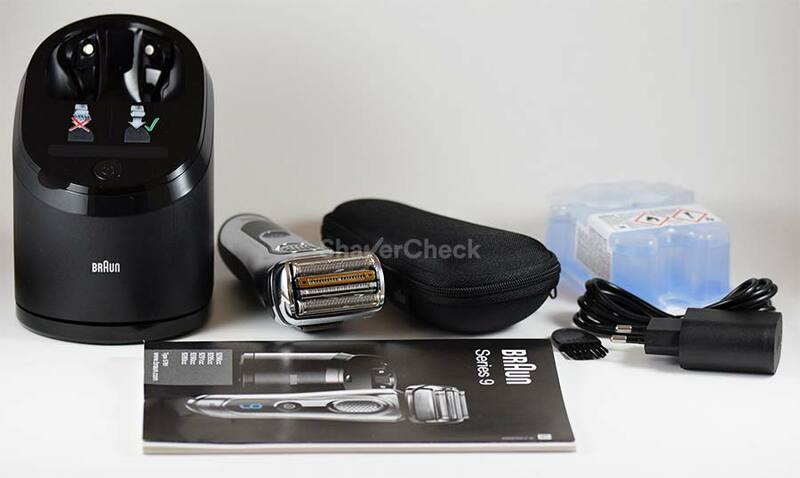 Since this shaver was already very comfortable and the closeness was adequate as well, I mostly used the 9290cc dry. With shaving cream the closeness was a bit better and the comfort outstanding, but overall the difference was negligible in my case. And that’s unusual for me as I normally get much better results when shaving wet, particularly with Panasonic and Norelco shavers. But that’s mainly because out of the box they’re not as comfortable as the Series 9. As a result, I didn’t feel the need to use the 9290cc with shaving cream. And there’s another reason for sticking mostly to dry shaving as you’ll see next. The cc in the shaver’s name means that it comes with an automatic cleaning station. As a result, you’ll have two methods of cleaning the 9290cc at your disposal: automatic and manual. Let’s start with the automatic cleaning. The station shipped with the Series 9 is specific to this line, being different than the ones included with the Series 3, 5 or 7. They all use the same cleaning cartridges, but the stations shipped with the Series 9, our 9290cc included, use a fan for the drying cycle of the cleaning process. 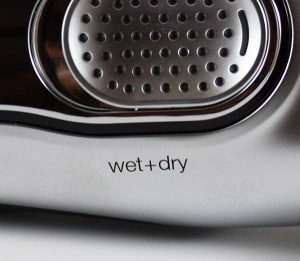 The old Series 7 station uses induction heat, the fastest and quietest method, while the Series 3 and 5 don’t have any active drying systems and therefore they take the longest to dry the shaver. Braun dropped the induction heating system altogether, so the Series 9 cc station is the only one in Braun’s lineup that includes an active drying system. 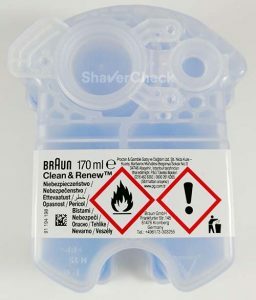 Apart from the design and the way the shaver sits inside the station, all Braun cleaning stations will automatically charge, clean and lubricate the shaver. As said previously, the drying feature is now only available with the Series 9. Let’s take a closer look at the station shipped with the 9290cc and see how it performes. The design is very similar to the Series 5 station. And that makes sense since the two shavers are very similar in terms of design and proportions, even though they’re in different categories of price and performance. There’s a single central button on the front that starts the cleaning and drying process. Right above that button you’ll find a sticker showing how you should NOT use the station. Precisely, you shouldn’t use it if your shaver is dripping wet or the shaving head is covered in lather. That’s a bit odd for a wet/dry shaver you would think. However, this is in my opinion the number one minus of this station and of all Braun stations that are shipped with wet/dry shavers. I wrote about this limitation before on numerous occasions, but what Braun basically tells you is that after a wet shave you should clean and dry the shaver manually before you can use the station. And that’s a big bummer if you planned on using the 9290cc with shaving cream or in the shower. Since shaving cream can clog the station’s drain hole (and the cartridge’s filter), you’ll be forced to do a manual clean beforehand and you’ll also have to make sure that the shaving head is (reasonably) dry before tossing it into the station. 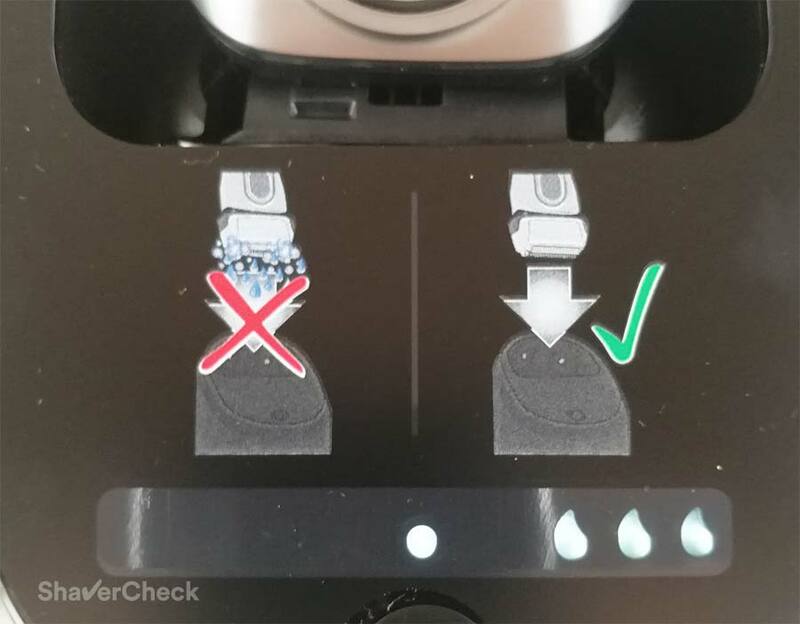 The cleaning stations from Panasonic and Philips Norelco don’t have this limitation and can be used with no restrictions, even though a quick rinse of the shaving head is recommended. Obviously, this won’t be an issue if you’ll be using your 9290cc dry. And I actually recommend you to do so and to consider a Panasonic or a Philips Norelco if you plan on using shaving cream or gel. Let’s now get back to actually using the 9290cc cleaning station. You open the base by pressing the button on the back, then simply slide the cartridge from the back until it clicks into position. Remember to remove the plastic cap from the cartridge before installing it. You then close the station, connect the cord and you’re ready to start. 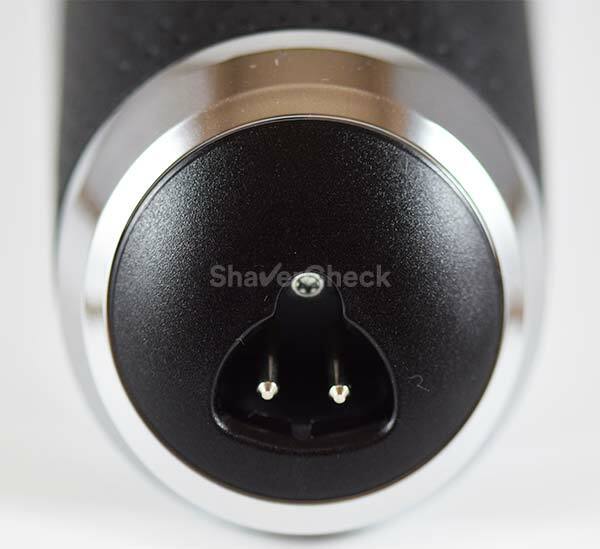 When placed inside the station, the shaver is automatically charged. The cleaning cycle is very short and takes just over 2 minutes. 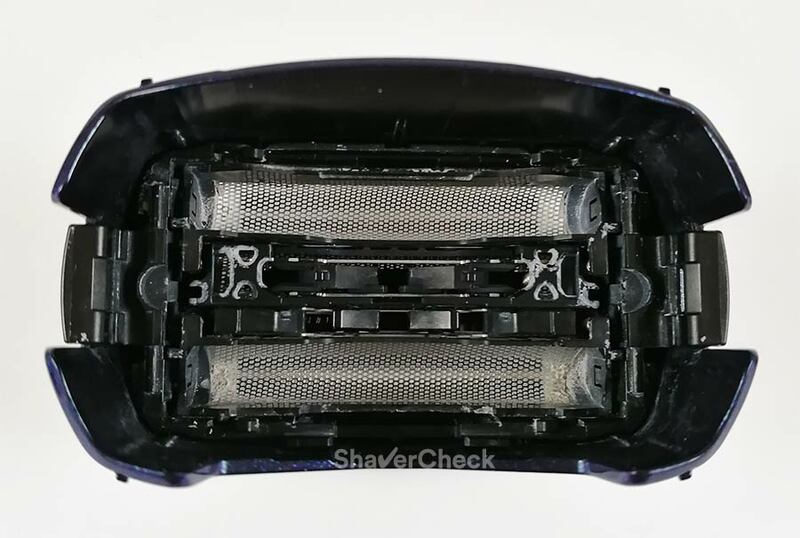 During this time the shaver is turned on and off and the cleaning fluid is flushed through the shaver’s head to remove hair clippings and dirt. 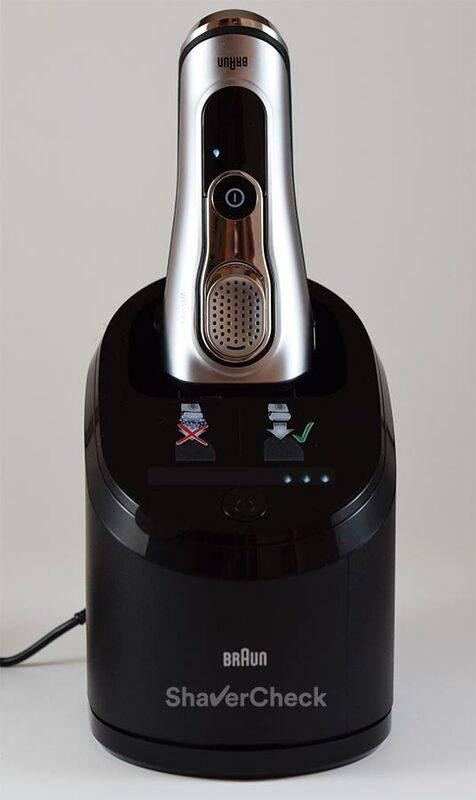 The shaver will signal when it needs to be cleaned by showing a water droplet on the LED display. The station supposedly analyzes the hygiene status of the shaver and selects an appropriate cleaning mode: short, normal or high intensity. The selected program is depicted by the droplet symbols on the station: one for short, two for normal and three for high intensity. However, my station never selected any setting apart from the high-intensity one. This was also signaled by some of our readers. I even cleaned the shaver immediately after one short session and the station still thought that it needed an intensive cleaning. Since even this intensive cleaning mode only lasts around 3 minutes, that’s not a big deal at all. There’s a very noticeable, but pleasant boozy, citrusy smell around the station that lingers on throughout the whole process. Once the cleaning phase is completed, the fan inside the station is turned on to blow dry the shaving head. The air passes through a slot inside the station and is directed toward the foils. Since the cleaning fluid contains alcohol, it will evaporate fast and the drying cycle took just under 40 minutes. The process is fairly quiet, even though not completely silent as in the case of the old Series 7 station that uses induction heating for the drying cycle. 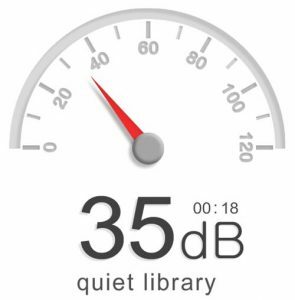 I measured an average of 35dB right next to the station. The room normally sits at around 24dB, so that’s reasonable. The result is a squeaky clean shaving head, ready for the next shave. The station did a fantastic job every time I used it. The foils feel oily to the touch and that’s a good sign as the cleaning fluid also acts as a lubricant so you won’t have to do it yourself. It really is a wonderful thing to always have your razor charged, lubricated and ready for another shave. The cleaning fluid also leaves the shaving head smelling really nice and fresh. It has a pleasant citrusy scent with just a hint of alcohol. Upon a close inspection after taking the shaver out of the station I could see just a few traces of cleaning fluid on the outside of the cassette, right below the foils. The foils themselves however were perfectly dry. It will be interesting to see how will the paint fare in time, being constantly in contact with the alcohol-based fluid. We know that the previous Series 7 didn’t do too well and after a couple of years the paint right below the shaving head would start to flake and chip. The damage was however only visual, with no effects on the performance and functioning of the shaver. 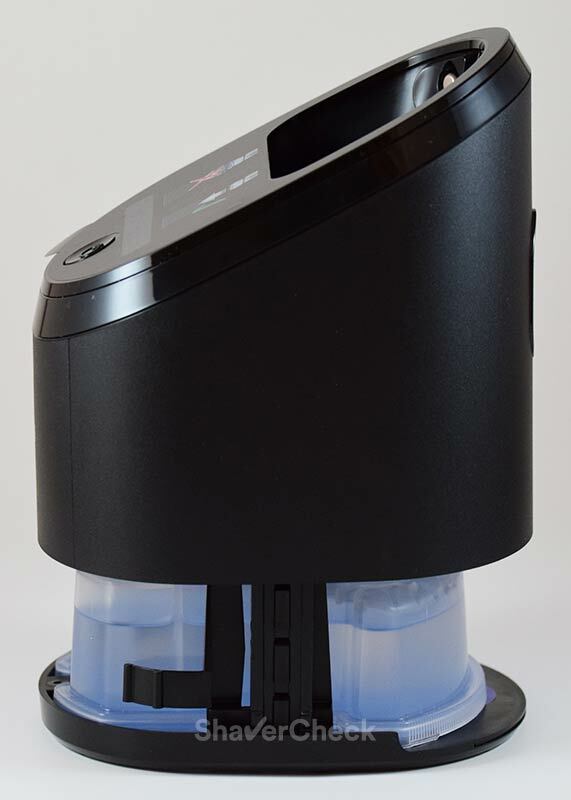 The cleaning station is a must in my opinion and the cost of the cleaning cartridges are fairly reasonable, especially if you opt for one of the third-party alternatives. However, the original cleaning solutions from Panasonic and Norelco are cheaper and usually last longer. You can get more cleaning cycles out of a cartridge by removing the shaving head and tapping it gently on the sink to get rid of the bulk of hair clippings before starting the automatic cleaning. Also, if you won’t be using the station daily, it’s a good idea to remove the cartridge from the base and put the cap back as the alcohol-based solution will evaporate fast. Depending on how you often you use the station, a cartridge should last for several months before needing to be replaced. I personally use the station approximately once a week and simply clean the shaver with soap and water the rest of the time. I’ll say it right off the bat, cleaning the 9290cc manually (or any Series 9) will probably not be enough in order to avoid dirt buildups inside the shaving head. No matter how hard I tried, it was impossible to remove all the hairs trapped inside the intricate cassette. You can use the included brush to sweep most of the hairs, rinse the shaving head under warm tap water or even use a bit of liquid soap, but again you won’t be able to quite match the results of the cleaning station. I normally advise our readers to skip the station if the shaver is easy to clean manually as for example Panasonic shavers are. However, in this case the cleaning station really is necessary and you should probably avoid the Series 9 variations that don’t have one, like the 9293s. The price difference is not that high and your costs of ownership with the cleaning fluid will be minimal if you use the tips outlined above. Also, a Series 9 that didn’t include a cleaning station will not work with one if you plan on purchase it later on. There’s been quite a saga with the Series 9 replacement shaving heads that started right after the launch of the new shavers. The shaving heads used by the original Series 9 shavers, the 90s and 90b cassettes, were nowhere to be found. If you were lucky enough to find them, the price was obscenely high. Moreover, there were some reports of the shaving heads falling apart after just months of use. 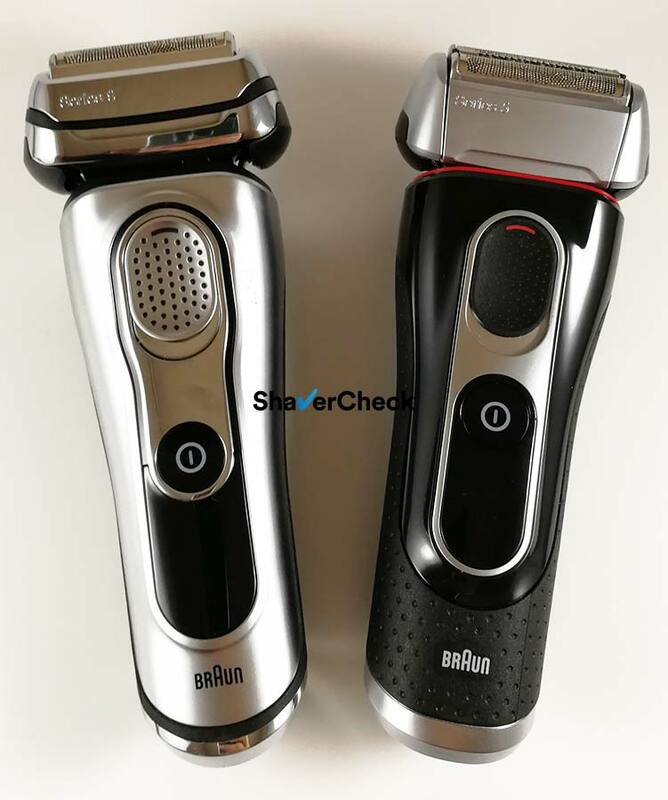 With the introduction of the updated Series 9, Braun also outsourced the production of the new shaving heads — 92s (silver) and 92b (black) — to a different manufacturer. After an initial shortage, the parts are now readily available and the price is also pretty reasonable, at least for a premium shaver. The Series 9 9290cc uses the 92s (silver) replacement shaving head. The 92s/92b cassettes are also backward compatible with the older Series 9 shavers. 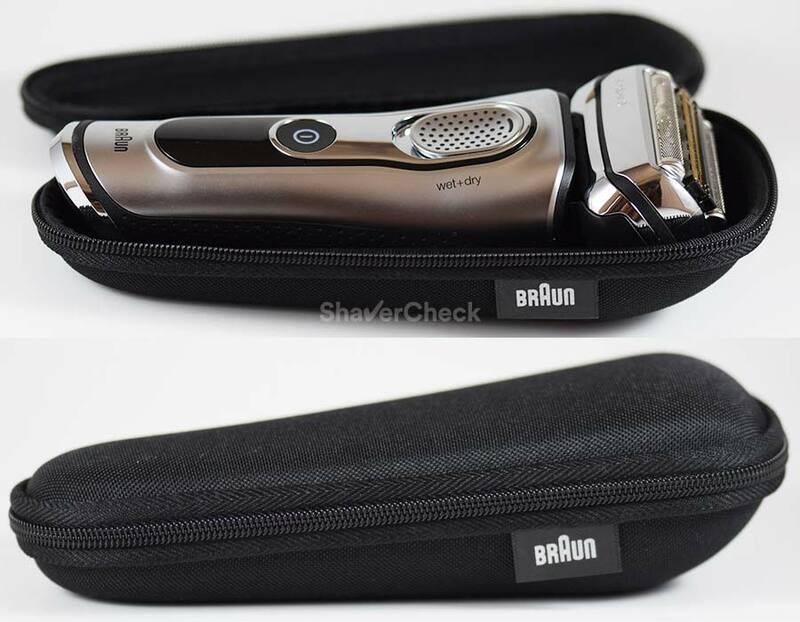 Braun recommends replacing the shaving head of the Series 9 once every 18 months, but in reality it depends on how often you shave, how coarse your beard is and how you take care of the shaver (cleaning, lubrication). I think it’s a fair assessment to say that the Braun Series 9 9290cc met and in some areas even exceeded my expectations. 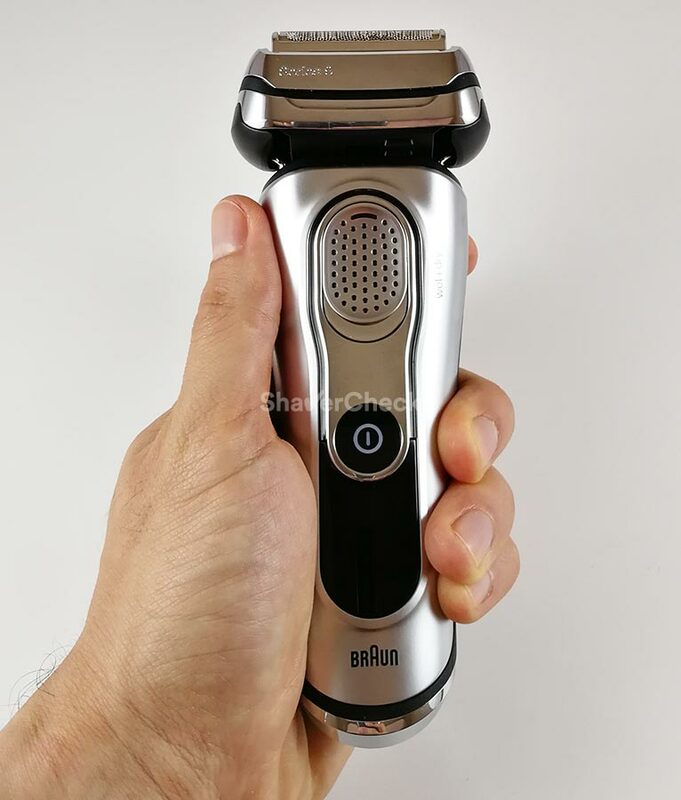 There’s a lot to like about this electric shaver and about the Series 9 in general, the highlights being the supreme comfort during the shave, its effectiveness at effortlessly shave even coarse and longer hairs and of course, the closeness. The construction is a bit of a letdown compared to the flagship shavers from Panasonic and Norelco, but there are no serious problems and some of the issues found on the older Series 7 were addressed completely. As a result, the Series 9 9290cc is a complete package and the shaving performance is excellent. 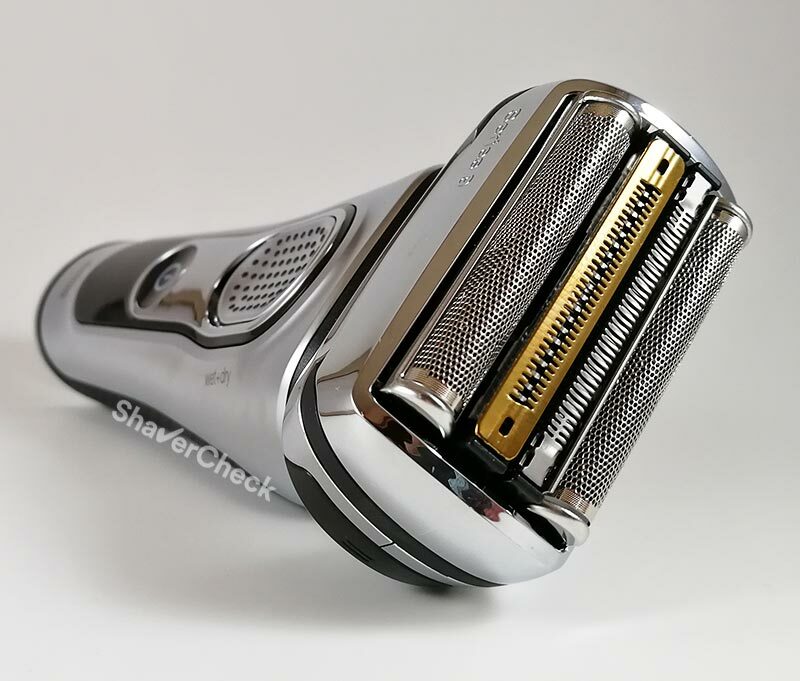 Unless you’re on a very tight budget or you’re just getting started with electric shaving and don’t want to spend a lot of money on your first shaver, the 9290cc will be a great choice for pretty much anyone. Granted, if you have light to medium facial hair it will probably be overkill and you’ll be just fine with something like a Series 5 or even 3. The Series 9 9290cc will be an excellent choice if you’re dealing with sensitive skin and razor burn; it’s by far the most comfortable electric shaver you can currently buy. Also, the Series 9 will work great if you have coarse facial hair as it has plenty of cutting power and will shave faster than most other electric shavers. As I said in the performance section of the review, during my tests the Series 9 9290cc performed great when used on longer, flat-lying hairs, so it will work great not just for daily use, but even when shaving every two days or more. If you have wiry hairs that grow in different directions the 9290cc should again be on your short list of shavers. As I said in my comparison of the Series 7 and 9, the older Series 7 will yield similar results for most users, particularly when used on shorter hair. Yes, the Series 9 will shave faster and smoother and I personally find the experience more enjoyable, but if you shave more often and don’t have a lot of flat lying hairs, the Series 7 will likely be good enough for you. You can go for a dry only model like the Series 7 790cc or a wet/dry variation like the Series 7 7865cc. However, I would still recommend getting a Series 7 that includes a cleaning station for the same reasons outlined in this review. 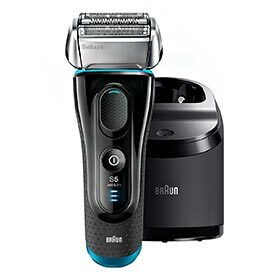 If your budget is limited, but still want an electric shaver that works great with sensitive skin, the Series 5 from Braun is an excellent option. The 5090cc/5190cc seems to be the best pick as it comes with a cleaning station and the price is right as well. Now, if sensitive skin is not an issue and you’re mainly interested in getting the closest possible shave, a Panasonic Arc 5 would probably be a better choice than the Series 5. The price of the latest Arc 5 (third generation) is currently very high and I don’t think it’s worth the money. With that said, I would personally go for a second generation Arc 5, like the ES-LV65-S (no cleaning station) or the ES-LV95-S (includes an automatic cleaning station). Panasonic shavers also work better in my opinion when used with shaving cream and are far easier to clean manually, so you can skip the station in this case and save some money while doing so. Finally, a more budget-friendly alternative to the Panasonic Arc 5 is another shaver from Panasonic, the Arc 4. With 4 blades, a powerful 14 000 CPM motor and super sharp blades, it will provide very close shaves for just a fraction of the price. My personal pick would be the ES-LA63-S, a fantastic performer that’s very reasonably priced. You can get it with a cleaning station as well in the form of the Panasonic ES-LA93-K, but it’s really not necessary. To read more about the Arc 4 family of shavers and the different models, check out this post. This may be a dump question to ask. What do you do with your old Electric Saver? I have a Braun Series 7, and it is very capable as stated in the review. But its head need a replacement and I am thinking of getting the Series 9 instead. Throwing it away seems like a waste, and I am not sure if anyone wants to buy a 2nd Hand Shaver. Any suggestions? I would have like if Braun offer trade in, at least they can recycle it. This is actually a very good question. I am not aware of any Braun trade-in programs unfortunately. Depending on where you live, you may have the possibility to simply take it to a local recycling center. Some local authorities offer a household recycling collection service. Finally, there’s the option of selling it, but like you said, being a used shaver I don’t know if you’ll have any luck selling it. Sell it on eBay for $50 – $70, cleaning station included, without the foil. It is easy to disenfect the razor body. I have sold two shavers, a previous Series 7 model and a Panasonic Arc4, with no problems at all. There are folks who will buy them to save money or as a backup/travel shaver. Will it affect battery life if I use cleaning station everyday? Battery would never drain. Using series 9 9290cc. Brilliant shaver. Best one ever used. Modern Li-Ion batteries are a lot less sensitive to these problems than they used to be. Manufacturers even recommend charging them whenever there’s a plug available. However, they do have a limited number of recharging cycles and if you charge them more often you’ll go through them faster. So the problem is not that the battery on the Series 9 would never drain (again, it’s not really necessary), the problem is that with using the station daily you’ll also be charging it daily. So the answer is yes, it will affect the battery life to some degree, but there’s really not much we can do about it. Some older Panasonic stations had the option to just charge or clean/dry the shaver, but that’s gone with the latest shavers. Even so, this is a very gradual process and your shaver should last for years. One charging cycle means from empty to full. So if you charge from,let’s say, 50-100 it’s just a half cycle! However a Li-Ion will age faster (and lose capacity) keeping it always at full charge. Excuse my poor english, I’m from Finland living in Germany so english is just my 3rd language. Thank you for the heads up. I actually wasn’t aware that a cycle only implies going from 0 to 100%. I was under the impression that topping off the battery always counts as a complete cycle. So the battery life will suffer after all, but for a different reason. Impressively thorough and most helpful. Thank you for your kind comment, I’m glad you found the review useful. Very thorough review and, for me, really helpful. I live in Italy and rasor prices are high but I want to replace my Philips series 7000 model. I will use the Philips as a backup. My question is: is it worth spending the money for a series 9 model or can a series 5 model do the same job even if you have to pass more times on your beard? I am not fully satisfied with how the Philips shave under my neck. I am not considering the Braun series 7 model because here the difference in price is not worth it. In the end of the day my question is if the series 5 will get the job done. Thank you for your comment and for taking the time to read my articles. Regarding the Series 5 and 9, that really depends. Both will get the job done eventually, even though how they actually get there will be different. How different depends on the individual. If you have very coarse and dense facial hair, shave less often and have hairs that grow in different directions and lie flat on the skin, the Series 9 will probably be noticeable better and your shave will take less time and be more enjoyable. If that’s the case then the Series 9 is probably worth the extra money. I would also recommend the Series 9 if you have very sensitive skin as it’s extremely comfortable and forgiving. If you don’t find yourself in the above situations, you won’t really benefit from the extra blade and features of the Series 9. A Series 5 will be good enough, particularly if you shave daily or every other day. For me the closeness of the shave with the Series 5 and 9 is very similar, maybe with a very slight advantage for the Series 9. I bought the Panasonic ES – LT2N a few days ago and I’m satisfied with it but, and it’s a big but, it seems a bit too harsh on my skin. The closeness and easyness of the shave are very good but after shaving my face is like burning for some minutes. Maybe it’s just my getting used to it or maybe it’s better to get the Braun series 9 just to not go wrong. Even if the Braun could be overkill I think I could not go wrong with it. What would you suggest? Getting a higher end Panasonic or going for a Braun series 9 or series 7 that should also be very confortable for the skin? I have this weekend for my decision because I can return and get the Braun on Amazon. Panasonics are arguably the best in terms of closeness, but this also comes with a small trade-off in comfort. If you have sensitive skin, they can be a bit aggressive. In your case the fact that you previously used a rotary Philips Series 7000 can definitely have something to do with your initial results; it can take some time to get used to shaving with a foil-based razor. A few quick tips would be to not press too hard and start your shave with the most sensitive areas. Always shave against the grain with straight, controlled strokes. I do not know your preference for wet or dry shaving, but adding a shaving cream could help. Regarding the other options, I’d say that an Arc 4 or Arc 5 won’t be significantly different with regards to comfort compared to the ES-LT2N. Maybe the latest LV Arc 5, but those are obscenely expensive. The Series 9 is again more expensive than the ES-LT2N. It is in my opinion the most comfortable shaver out there right now, however, it doesn’t shave quite as close as the Panasonics. As you can see, there’s no perfect shaver and you always have to make a compromise when buying one. If you have the possibility, give the LT2N more time before returning it and see how it goes. If you fail to see an improvement after 2 weeks for example, then it’s time to consider other options. thanks for your reply. I’ll follow your suggestions and give it a 2 week try. If the situation does not improve I’ll consider other options (mainly Braun is the only other option). I only do dry shave and I wonder if a pre-shave lotion could help. If you think it could be a good idea, can you suggest a good one with not a marked scent and not too oily? You should definitely try one out; I almost always use a pre-shave when I shave dry and at least in my case the results are clearly better. The Aramis Lab Series is one that would fit your requirements, but it is a bit pricey, especially compared to other products like Williams Lectric Shave or Afta Pre Electric. These two however exhibit precisely what you’re trying to avoid (oily residues/strong fragrance). Thank you for your comment, Alin. I’m glad you found the information useful. Loved the review! I just have one question, is there much difference between the 9290cc and the 9295cc? I have the latter one but I don’t see any difference that is visible between the two models. Could you answer this one questions for me? Thank you for your comment, Joe! The 9295cc has a glossy, chrome-like finish, while the 9290cc has more of a frosted, matte finish. It’s pretty difficult to notice this from Braun’s official product photos. Other than that, the two models are identical. Ovidiu, thanks for you response. I did enjoy the review and am happy that my razer is as good as the one you reviewed. I look forward to more reviews from you. Keep your excellent work. You are very welcome, Joe. More reviews and articles will follow soon. Thank you again for the kind words. I agree, the shaving head of the Series 9 is difficult to clean with a brush. That’s the case with the current Series 5 as well since it uses a similar cassette with the blades and foils merged into one piece. I think you’re referring to the first generation Series 5 (now discontinued) that was indeed using separate foils and blades. 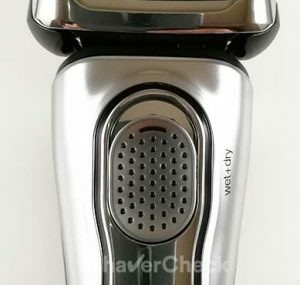 I’m planning to buy a great shaver for my father’s birthday gift. And yesterday I just read an article https://10techy.com/braun-series-9-comparison/ and it said that Braun Series 9 9295cc is the latest model of series 9 right? what is the different between 9295cc and 9290cc? why it has so many series? The Series 9 9295cc has a glossy/chrome finish, while the 9290cc comes with a matte, frosted treatment. Other than that they are exactly the same. Both are part of the updated (latest) Series 9 iteration. Regarding the excessive number of models, here is a detailed article on that topic that I wrote a while back. I tend to recommend the 9290cc over the 9295cc as the matte finish is much better at repelling fingerprints and smudges, it’s widely available in most countries and also tends to cost less. But you can go for either of the two as underneath they are identical. Is it possible to use the shaver safe enough, especially HyperLlift & Cut and Direct & Cut trimmers if I have some small birthmarks on my neck? I’m afraid that can damage and cut them. I tried to use just a basic foil from Braun Cruzer and it was ok.
Hope for your answer like a person who used the device by yourself. Thank you! I’m really not the most qualified person to answer this and it also depends on the particularities of the birthmarks and whether they pose a risk to using an electric shaver, so it’s very difficult for me to give you a definitive answer. If you used the Braun Cruzer without the comb attachment and everything went well, the Series 9 should also be safe to use. It is very gentle and forgiving, but you should nevertheless be extra careful when going over that area, making sure not to press too hard. Thanks Ovidiu for the great review. I have the 9295cc. What are your thoughts about using it with shaving cream? Do you need to rinse it clean before putting it it the cleaning center, if usisong it with shaving cream? Would you recommend using it with Pre-Shave ? If using it with a Pre-Shave Gel, would you also need to rinse it off, before putting it in the cleaning center? What about a post shave moisturizer? I have been trying the Art of shaving products and like them. Thank you for your comment. If you use your Series 9 with shaving cream, I would strongly recommend a manual cleaning before using the cleaning station. Personally, I haven’t found shaving cream to improve my shave with the Series 9, so I always shave dry. I usually use a pre-shave lotion (Williams Lectric Shave), which is alcohol based and evaporates within 10 seconds once I apply it to my face. As a result, it doesn’t leave any residues on my shaver and it doesn’t require any cleaning. Theoretically, things should be the same in the case of a pre-shave gel. However, I found that some of them (for example Afta by Mennen) will gum up as a result of rubbing the foils against the skin. In that case, you may need to clean the shaver manually. I simply don’t use a gel and stick to lotions. Williams Lectric Shave and Aramis Lab Series are two great options. Regarding post-shave moisturizers, I mostly use the Proraso Aftershave Balm for sensitive skin and Truefitt & Hill Authentic No. 10 post-shave balm. Art of Shaving has some great products as well, but they are pretty difficult to get here in Europe. I read your reviews on Braun 9290cc. it was useful. And I want to add that this shaver is excellent for full body shaving as well. I have been using it for my face and full body shaving close to skin for several days and found it excellent quite satisfactory. thanks Braun for his technology. Thank you for your comment. I’m glad to hear that you’re satisfied with the performance of your 9290cc. What’s the difference between the series 9 9295 and the series 9 9290? Is the performance the same? Just wondering, when traveling it seems that the cleaning station would be bulky to pack and take some space in the luggage. Is it safe to say that you can manually clean the series 9 for a few weeks and not have any issues? Secondly do you have to use the station or clean with water after every shave? I am changing over from a Gillette bladeand shavibg cream so just wondering. Absolutely not a problem. In fact, this is how I clean most of my Braun shavers even when I’m not traveling. It’s a good compromise that allows me to save some money on buying new refills. I use warm tap water and a bit of liquid soap (and only use the station after 3 or 4 shaves). 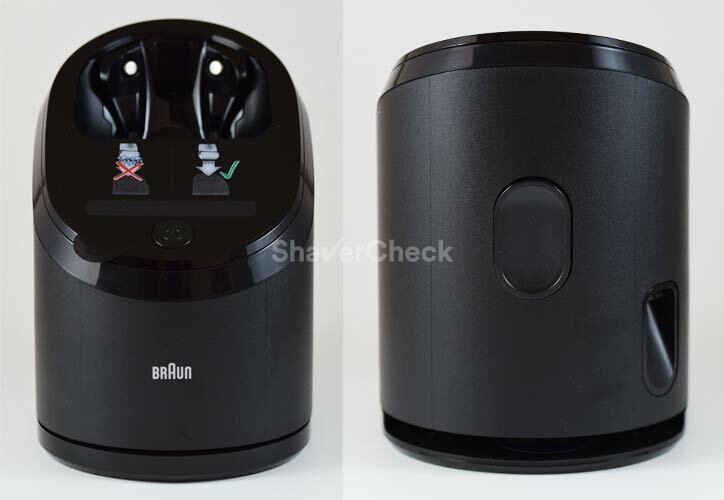 Does the braun shaver 9290 and the 790 share the same battery and what is the spec.? Yes, they use the same battery (part number 81377206). Congratulations great and informative reviews. I decided to buy a 9295cc as the cleaning and charging station is good to have as you mentioned in your review. Would a shaving oil be a good idea? A (pre) shave oil can help, some users have found them to be really effective, others not so much. The best thing to do is to try one yourself. I would go for a very light/watery oil and use it very sparingly so it won’t clog the shaver. Also, it would be a good idea to clean your Series 9 with a bit of water and liquid soap to remove most of the oil before using the cleaning station. It’s not absolutely necessary, but doing so means that you won’t need to replace the cleaning cartridge as often. Like you wisely recommended to minimise cartridge replacement I will use the Clean & Charge station after 4 uses or so and manually clean daily. In this mode of use is weekly oiling necessary? Any idea what the cleaning solution consists off? You are very welcome, Stavros. As a rule of thumb I recommend lubricating your shaver after every cleaning if it involves the use of soap as that pretty much removes any form of lubrication. A single drop of light oil (sewing machine oil, clipper oil) on each foil will suffice. Alternatively, you can use a spray lubricant like the Remington Shaver Saver. The cleaning solution is alcohol-based — Isopropyl alcohol or ethanol in a special denatured form (SD – Alcohol 40 – B) — and includes a few other ingredients as well (perfume, Limonene, Citral). There are some cheaper alternatives out there like the ones from ccrrefills.com, but I haven’t personally tested any of them. Thanks very much for your advise, very much appreciated. I just bought one of these today. 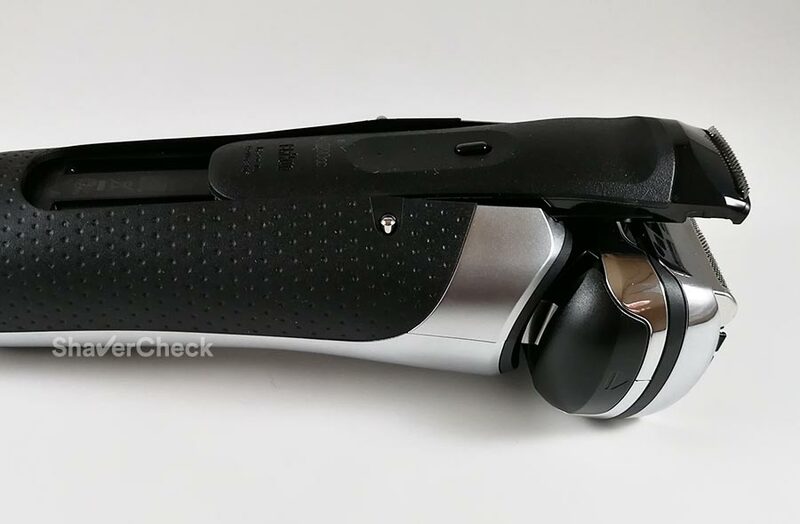 Are the blades on the long hair precision trimmer supposed to visibly move when the shaver is engaged? They don’t seem to be doing anything. The trimmer has a pair of blades just like regular hair clippers. 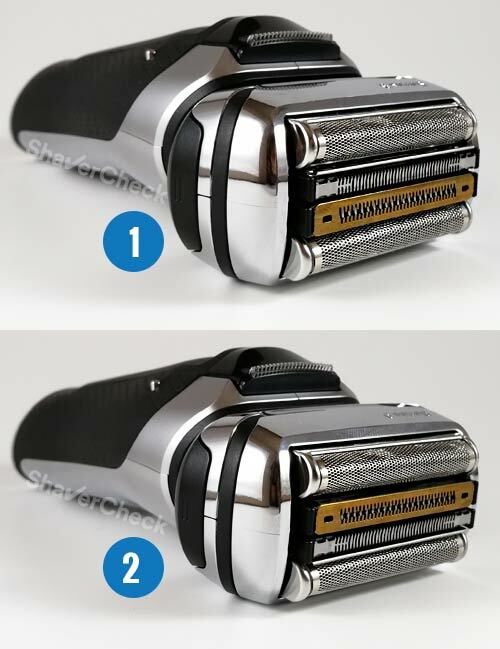 One blade is stationary, while the other one moves from side to side when the trimmer is fully extended and the shaver turned on. You should be able to see it if you look very carefully up close. I have used a Panasonic razor for many a year and always satisfied but wanting to have a new razor contacted Panasonic where I had short change so I went over to look for a different make, on finding your articles I thought to try the Braun , on reading your very thorough and useful report I made up my mind to go for your choice of the 9- 9290cc and found Robert Dyas to be the best value and am now awaiting delivery. Thank you for a really wonderful report the best I have ever seen for anything. Thank you for your comment, Robert. I really appreciate it. Hope you’ll enjoy shaving with your new Series 9. Thank you for your excellent detailed review! No question from me, just comments. I have used Braun shavers for many years. Series 3, 5, and 7, and I am very satisfied with their high performance, after switching from a Norelco triple head shaver that gave me razor burn on my neck. My second Series 7 sounds like a lawnmower, again. In the Braun’s defense, I have a heavy beard, crazy hair directions on my neck, like you, plus I shave both my face and whole head daily. Braun fixed my heavily used Series 7 under warranty and the repair lasted about a year. I tried to get an answer from Braun about how long a foil cassette should last, but they wouldn’t comment other than their standard 18 months recommendation. With the Series 7, I notice an increase in the shaving time in less than one month after installing a new cassette. I can get about 7-8 months out of a cassette before I put a new one on. With an older cassette, it takes me 12 minutes to shave. I figure I am doing about 2.5-3 average shaves each day. So, I guess that is not too bad. I will be buying a new Series 9, next. Thank you for taking the time to share your experience, I really appreciate it. The lifespan of a shaving head depends on the coarseness of the beard, how often you shave and how well the shaver it’s being cared for (cleaning, lubrication). So you are absolutely right — 8 months with daily 12 minute long shaving sessions (and a heavy beard) is not too bad. Thanks for the awesome review! Years ago I bought a Braun Cruzer 6 and it was completely useless, so much so I just chucked it in some box. Thinking about a series 9 now, but I was thinking maybe my facial hair is just not compatible? What do you reckon, try the series 9? go for an another model with rotary? I just tried the Cruzer and it managed my moustache in about a 100 passes, but beard is still at 4-5mm whatever I do (strecth or no). Thanks for the awesome review! The Series 9 should be a massive step up from the Cruzer in terms of performance. 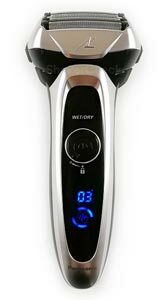 It is a superior shaver in pretty much every aspect and you should see a significant improvement to your results. In my opinion foil shavers are a safer choice and for most users this type will yield better results. The Series 9 is very capable with difficult facial hair — longer, wiry, flat-lying whiskers. However, do keep in mind that electric shavers work best on short hair, so if you haven’t shaved for 4-5 days or more, it would be highly recommended to trim your beard beforehand using a regular trimmer. A hair length of 4mm is the uppermost limit for an electric shaver in my opinion — and that’s with a high-end razor like the Series 9. Anything longer than that would require some pre-trimming. After about a year of using it everyday, something went wrong and the turn on button start giving me problems, To turn it on I have to hold my finger on it until a lock icon start blinking then to shave I have to hold the button untol finish or will stop, but it also gave me other problems that are a little to much to mention here. I was hoping it last me for some good time, but that was not the case. In the last few days before return it, it was turning on by itself in the middle of the night or at different times. Also it was a little hard on my chin as it is one of the hardest part to shave. Plus it is very noisy. it does shave very closed but it is a little hard on the face. now the cleaning situation is very good as it is easy to clean with liquid soap and water.My didn’t come with a brush or oil, that’s the way they sell them here in usa. Now I return it to the place I original purchase it here in USA as they give me one year warranty. so that was a plus. My problem is now to decide if buy another panasonic, or go for the braun 9 series, .I’m not to happy knowing that the brush does not clean is not enough to clean it,,and using the machine to clean it up it kind of cost more. Thank you for your comment. The Series 9 doesn’t shave quite as close in my experience, but it’s definitely close enough for the vast majority of users. As for comfort, it is significantly better compared to a Panasonic Arc 5, especially when used dry. The Braun Series 9 is more fiddly to clean manually, therefore I think the cleaning station can be beneficial. The good part is that you can work around the high costs of buying new OEM refills. I wrote a detailed article about this here. You can also make a refill last much longer by following just a few easy steps. I’m not saying that you should definitely go for a Series 9 this time; this should depend entirely on your shaving experience with the ES-LV9N — minus the power button issue, I tend to think that it was just an isolated problem. For example, I would opt for the Series 9 if I were to shave dry most of the time and not too often — the Series 9 is much better for longer facial hair as well. It’s also much gentle to the skin, so if you have sensitive skin it may be a better option. The Arc 5 excels at shaving (short hairs) very close, but somewhat at the expense of comfort. Your reviews are fantastic. Thank you. I have a Braun 8585 from ~2004 and am thinking of upgrading to the 9295. I’ve carefully read your reviews of the Braun 5, 7 and 9 series and it seems to me that in each review you’ve argued that the lower model is *essentially* just as good as the higher model. Am I misreading this? Basically, I’m asking if I should bother upgrading my current 14 year old 8585? My current shaver is in great shape, with cutter and foil replaced annually. Will I notice a difference? Thanks in advance and keep up the great work! Thank you for the kind words, I’m glad you found the reviews useful. Unfortunately I didn’t get the chance to shave with the 8585 back in the day, so I’m afraid I cannot compare it directly to any of the shavers you mentioned. The high-end Series 9 will offer diminishing returns over a Series 7 and in my opinion the 7 will be good enough for most users. Shaving with a Series 5 will yield similar results, but the Series 7 is a bit faster (in the highest power setting), a bit more comfortable, it vibrates less, has a slightly smaller shaving head and because of all these things it’s just more enjoyable to use overall (at least to me). A modern Braun shaver should be better than a 14 years old model, but how much of an improvement will it be for you — that’s a different story. Some users will see a significant improvement, others not so much. If you’re satisfied with the performance of your 8585, I’d say to hold on to it for a while. From what I can see, there’s no reason to upgrade right now. When you decide to do it, consider the Series 7 as well before pulling the trigger on the 9295. For most users it will be an excellent choice. I own both a Series 7 and a 9 and I use the Series 7 more often, mainly because it’s a lot more nimble and maneuverable. Just wanted to thank you for the excellent reviews and articles on the world of electic shavers. I have struggled for years with ingrown facial hair resulting from blade shaves, and had tried both foil and rotary electrics many years ago but was unimpressed with their ability to handle those difficult curved hairs that tended to grow in. I was doing some research on the ingrown whisker problem and came across an article which got me thinking about electrics again. That in turn led me to your website, which is the only one I found that relayed credible real person results on multiple brands and styles of shavers. Buying a shaver today is more complex than I had imagined, and having a resource like this really helped narrow the field. I ended up going with the Braun Series 9 with cleaning station, and have been using it for about 2 months now. I couldn’t be more impressed with the smoothness, lack of pulling on long hairs, and how well it picks up whiskers that are curved and close to the skin. You are absolutely correct in saying that shaver choice is dependant on individual facial conditions, and your testing gave me the exact info to make an informed choice. Thanks again and keep up the great work!! Thank you so much for your comment, I truly appreciate it. Glad to hear the Series 9 proved to be the right choice. I was skeptical about buying this after reading lots of online reviews, but the $80 off and 20% coupon at Bed Bath and Beyond brought the price down enough for me to make the jump. I have very thick facial hair and have never found a electric razor that worked well. After charging this for the recommended hour, I gave it a whirl. I first had to shave my full beard down to stubble using my Wahl hair clippers, which left me stubble length of a two day growth. The Braun 9 series had no issue shaving it all down. It took me a bit longer to shave as it was my first time and was learning my shave angles that work with my growth pattern. No hairs were left behind. The razor foils left zero irritation or burn, and the razor gives a very close cut, I’d like to say even better than my Gillette mach3 razors. I’m looking forward to using this every couple of days if not daily. Keeping the foil package clean and lubricated is a must as this thing is fast and I don’t want to wear things out without proper care and maintenance. The cleaning station Is a bonus, not sure how often I will use it over rinsing under hot water after every use and oiling once a week, but there are lots of DIY solutions for the cleaner that will help save $. This is just first shave opinion, and I’m hoping my feelings won’t change as I continue to use the series 9 from Braun. Thank you for taking the time to write such a detailed feedback. Glad to hear the Series 9 was the right choice for you. You are right, there are DIY solutions and also a few third-party options that will be more cost-effective than Braun’s refills. I also use the cleaning station sparingly, usually every week or so. I the meantime I simply clean my shavers with warm water and a bit of liquid soap (I follow up with a lubricating spray or clipper oil). This approach works the best in my opinion. I just got one of these with a great $70 instant discount at Walmart plus the current $50 mail in rebate. So great deal. Made it about the same price as a similar 7 series. I had a terrible many time years ago trying my dad’s electric rotary. I’m sure they are better now but I didn’t want to even try an electric. Unfortunately I have become very ill and will be receiving and organ transplant soon. One of the warnings is not to use a blade for shaving (infection risk). So I decided to explore electric. Thanks to your reviews I settled on this razor. I am only two shaves in but WOW it is comfortable and easy. And seems close enough for me. It doesn’t seem like I have much choice but my initial impression is very positive. I actually was excited to shave today. And hey I can use it in my hospital bed. Your first time with electric and various posts about pre and post shave routines also are really helpful. I’m going to have to work a bit at technique – what have you – as a couple of spots aren’t quite there yet. But I am sure that will come soon. Thank you so much for your comment. Glad to hear the Series 9 was the right choice and that you enjoy shaving again. With a bit of practice and patience, your technique will definitely get better. I hope everything goes well with your transplant and I wish you a complete and speedy recovery. great review, thanks, very useful. I own a Series 7 and while I’m generally happy with the result I’m looking to the 9 to maybe do it a little quicker – sometimes I need a number of passes before I can get a close enough shave and as I’m having to buy a new cassette anyway it may be a good time to upgrade further. But I’m a bit bewildered by Braun’s numbering system. Your review was not that long ago but now I’m seeing adverts for 9296cc and even 9297cc. Even Braun’s own website doesn’t give any info on what changes may have been made. The thing is, one website is offering a pretty good price for the 9291cc but before I take the plunge I just wanted to make sure the 99 or 97 don’t offer some improvement I may regret not getting. Any help you can give much appreciated! Thank you for your comment. I agree, model names can be very confusing. Fortunately, in terms of shaving performance, the Series 9 models you mentioned are absolutely identical. First of all, Braun uses different names for shavers sold in different parts of the world. For example, as far as I know, 9297cc is just the name of the shaver sold on the Asian market, but it is identical to the 9295cc. The 9296cc is just a 9295cc that comes with a hard leather case instead of the textile one. 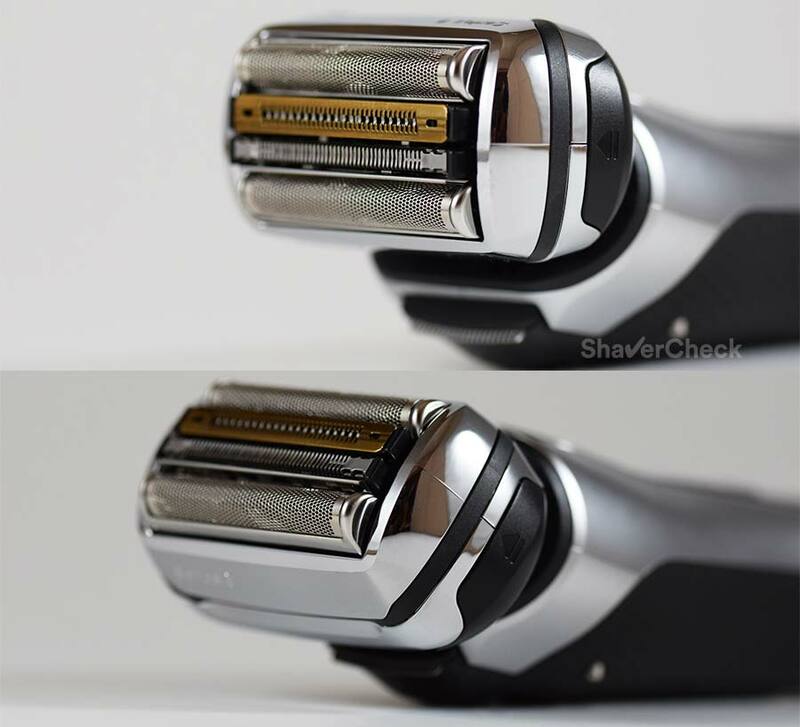 Again, the shavers themselves are identical. My advice would be to simply get the one you can find at a better price. It does indeed. Thank you so much for your quick reply. 9291cc it is, then! one quick question: as far as you know does shaving with talcum powder harm the razor? Thank you, Enrico. A mineral-based powder like talcum can lead to a premature wear of the blades, so it would be safer to avoid any talcum products. I would recommend using a pre-shave lotion instead (Lectric Shave, Speick or Freelette). Love this razor. I am due for a transplant soon and due to risk of infection one of the changes they suggest is to move away from blades for shaving so I started to explore the electric option. Your site is fantastic. I was concerned about the switch as decades ago trying my dads electric was horrible. This is amazing. Quick, comfortable, I actually look forward to shaving. And you reviews of pre and post shave routines and products is great. I seem to do well with the cheap products like Lectric Shave and Aqua Velva but the Nivea cream is also great and inexpensive. I got my 9290 really cheap with a deal through Walmart and the rebate which I hope arrives soon. Very highly recommended. And thank you for help choosing. Thank you so much for the kind words. Glad to hear the Series 9 is working great for you. Your review helped me decide on buying series 9000 (I bought the 9299, kind of “gold” edition). I’m a frequent traveler so the cleaning station is irrelevant. So – great shaving machine, totally worth the money, cleaning is fiddly indeed but manageable. I recommend it to anyone. It totally changed my mind on shaving machine (as I tried Philips machines in the last and was always disappointed). Thank you for taking the time to share your experience. Glad to hear the Series 9 is working great and you enjoy shaving with it. I shave very early in the mornin whilst my wife is still asleep so noise is important to me. Do you know how noisy it is compared with the series 7? Thank you for your comment, John. The Series 9 is a bit quieter compared to the Series 7, but only slightly. Measured with a smartphone app, the Series 9 is quieter by around 7 decibels, which isn’t much. So in my opinion you shouldn’t upgrade to the Series 9 if you’re only doing it to get a quieter shaver. All foil shavers are pretty loud. I stumbled upon your review of the Braun Series9 9290cc and am very impressed not only with what you had to say about it, but your review all together. Very well done! Most, if not all of my questions have been answered thanks to you. I currently h ave a series 7 Braun and so far am fairly happy with it. The only negative is in my case (fairly sensitive facial skin, coarse whiskers) I don’t get a very close shave without going over my beard numerous times causing a burning most of the time. So every time I search for a replacement cassette, I do a search for a “better Braun”. That is what led me to your review. I think you’ll see an improvement with the Series 9 — it is faster and more efficient, requiring fewer strokes for a smooth shave. Since my last post, I was able to find a new Braun 9290 on eBay for a steal. The razor arrived in the original packaging, unopened with everything sealed from the factory so I was relieved to find that it actually was “new” as advertised! I started using it the next day, as I didn’t have any pre-shave and had to purchase some. From the get-go I was extremely impressed! VERY smooth shave, no razor burns, and only went over my beard one time. Since then, I’ve used it in the shower with a shave cream with great results. I highly recommend this Braun Series 9 shaver to anyone who is struggling with electric shavers. If my experience is any indication, no one can go wrong with this one! Apparently, Braun has finally gotten it right! Glad to hear that, thank you for taking the time to share your impressions. Enjoy using your new Series 9! Great review and a great site, congrats mate! Since I now clocked enough time on my Series 9, I wish to comment on the longevity of the 92 s/b heads. According to Braun, the head should be good for 18 months. If we assume a daily shave, with skipping a day occasionally, this means something like 450-500 shaves per head. This is a bit optimistic IMO. I just replaced the shaving head after (rough estimate) not more than 350 shaves. I could have used it for some more time perhaps, but it was already obvious that the shaves aren’t as close and comfortable, as they used to be. Yes, I have a rather coarse beard, but very seldom use my electric on a more than 36 hours growth, so the shaver hasn’t been abused with a long, hard stubble. Also, approximately half of these shaves have been with a shaving cream, i.e. on a well softened and lubricated whiskers. What are your observations in this regard? Thank you for your comment and feedback, much appreciated. Those 18 months of use are a bit like the official mileage numbers we get from car manufacturers: they’re not really relevant for the real world and we don’t know exactly their methodology of testing. For example, Braun could’ve very well assumed that a shaving session lasts 3 minutes, when in fact shaving takes longer than that for most users. We also don’t know when Braun considers that a shaving head needs to be replaced — maybe some discomfort or some hairs getting yanked is considered normal and in their view the cassette can still be used for a while. These parts are also tested in ideal or favorable conditions — for example, a medium beard as opposed to a coarse one. Proper cleaning and lubrication will also affect the lifespan of the head to some extent. Overall, I’d say that 350 shaves out of the 92s/92b is ok-ish. Not great, but definitely not terrible. Thanks for your comment Ovidiu. I’ve always used my cleaning station to clean and maintain the shaver after every use. Apparently, this is the life of the cassette for my beard. The cleaning station itself should not, under any circumstances, be cleaned with water. All you need to do is to wipe it with a soft cloth, maybe a little bit damp, and the inside of the tub as well. If the drain hole is clogged (usually signaled by the cleaning fluid not draining back into the cartridge) you should use something like a toothpick to remove the dirt that’s causing it.